Should you opt for a Scoliosis Brace? Learn why scoliosis brace can be counterproductive in the management of a scoliotic spine for experts that treat scoliosis with great success. Scoliosis brace (straps, reinforcements or props) has been a standard method of treatment and management of the scoliotic patient. Bracing children with scoliosis started some 450 years ago in Paris. And in all that time, there is few published literature that showed clinical successes. Recent published medical research has been critical of bracing regardless of type. Therefore, we encourage our patients to avoid scoliosis bracing and opt for therapeutic measures that target the malfunctions tissues in a scoliotic spine. Before we get too in-depth into the scoliosis brace or bracing, it might be of help for some to cover some basic scoliosis information. Adolescent idiopathic scoliosis is the most common form of scoliosis, which makes up about 80% to 85% of the total scoliosis population. Scoliosis is usually confirmed through a physical examination by a clinician or a physiotherapist, or through an X-ray. Scoliosis is classified as mild, moderate, and severe, depending on the degree of curvature. Most centers recommend a scoliosis brace for scoliotic children between the ages 10 to 15. The vast majority of these centers target kids with curves between 20 and 40 degrees for their scoliosis brace. They promote their scoliosis brace as a means of delaying or halting the progression of scoliosis and scoliosis pain. Some recommend bracing because they believe that a growing child needs restricted support during active growth periods. Others relate that bracing will further weaken the soft tissues, leading to additional issues that would otherwise not be present if the child were not braced. While both have merits, we tend to relate to those who recommend avoidance of braces when it comes to scoliosis. Bracing was a great option in the 1500’s when Ambrose Pare, a French surgeon developed it for spinal deformities such as scoliosis. However, times have changed and today’s modern therapeutic approaches are superior to that which was available some 500 years ago. As such, we encourage parents with scoliotic children and adults with scoliosis to opt for target-specific treatment and to avoid any form of bracing for scoliosis whenever possible. However, there are situations where a brace can be helpful. So, the only time we would recommend a brace is for infants (infantile scoliosis) who are diagnosed with scoliosis. Before we expand on this topic, it would serve us better if we provide some basic information on the types of braces available. Bracing, regardless of type, is meant to manage scoliosis. To date, there aren’t any braces that can effectively reduce or reverse scoliotic curvature. However, there are plenty of researched documents suggesting progression of the curve in those that wear braces. Having said that, let’s look at the types of braces available on the market today as well and the standard recommendation on their use. There are different kinds of braces available today. Some braces require full-time wear, which is worn around 18 to 23 hours a day, whereas others are only worn 8 to 10 hours per night while sleeping. Some braces are made of rigid plastic while some are made of elastic materials. The Boston brace or strap was the most commonly used brace for scoliosis. This strap or support is worn 23 hours per day. It is also known as an underarm brace. Their plastic components are custom-molded to fit the patient’s body. This type of brace works by applying 3-point pressure to the curve in hopes of preventing progression. It forces the lumbar region into flexion while pushing the abdomen to flatten the posterior lumbar curvature. The TLSO brace is prescribed for scoliotic curves in the thoraco-lumbar or lumbar sections of the spine. What is the advantage of the Boston’s Support Method? It is the first scoliosis brace to eliminate the metal superstructure, making it less noticeable beneath clothing. What are the Disadvantages when it comes to the Boston’s Strapping Device? Compliance issue. Teenagers find it tough and uncomfortable to wear the rigid plastic for 18 to 23 hours per day. It squeezes the chest and ribs, which makes breathing difficult. Children can suffer from losses in breathing capacity. It limits muscle and soft tissue mobility, thus weakening their strength, which some link to worsening of scoliotic disorders. This type of brace is worn only at night; it is also known as the “part-time” brace. 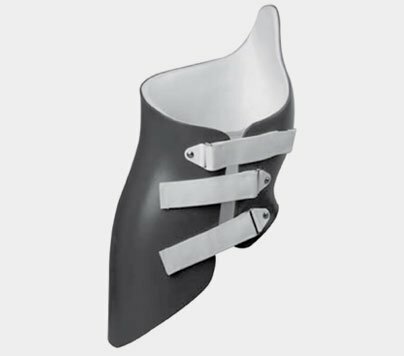 The concept behind this design is that it fixes the patient in an overcorrected position to stretch the spine more aggressively, with a stronger corrective force as compared to the traditional TLSO braces. It is the first side-bending brace molded to follow the patient’s spine while the patient is bent towards the convexity of the curve. 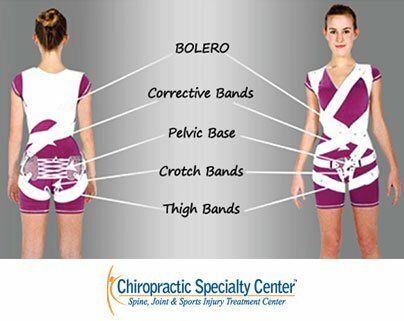 What is the Advantage of Charleston Bending Spine Strapping System? Wear time is significantly reduced to only 8-10 hours at night during sleep. Are there Disadvantages with the Charleston Bending Support Methods for the Spine? The overstretching of the spine can be very uncomfortable. This brace can cause a lot of muscle soreness. The brace can worsen a secondary curve if there is any because it only addresses the major or primary curvature. The brace leads to decreased muscle activity and eventual weakness, though not as severe as other braces. SpineCor is a flexible bracing system that allows partial movement and is adjustable to accommodate a child’s growing body. It is different from conventional non-surgical treatments which are mostly rigid and hard. Usually, this brace is worn 20 hours per day and must be worn while sleeping. The length of SpineCor bracing will depend on the child’s age which is always a minimum of 18 months. What are the advantages of the Strapping with the SpineCor Systems? It is fully flexible, allowing normal body movement, and children can lead a normal life. It is easily worn underneath clothing. What are the Disadvantages when it comes to the SpineCor Straps? The Scoliosis Research Society found no significant difference between SpineCor and TLSO braces regarding improving or stopping a patient’s curvature. Muscle atrophy can happen even with an elastic brace. The costs involved and lack of the clinical data revealing reduction of the scoliotic curve makes this brace as well as all others in our opinion useless. In short, our clinal teams of scoliosis-specific physiotherapists coupled with our target specific scoliosis Chiropractic treatment works better in comparison to a scoliosis brace. Why Straps Supports, Belts and Reinforcements of the Spine has failed to show clinical significance? They cause muscles to weaken. Being in the braces for 18 to 23 hours a day significantly reduces muscular activity. Over a period, the muscles in the whole trunk atrophy. The curve will undergo a sharp increase once the brace is removed. This is because the surrounding muscles and joints are weakened. It creates self-esteem issues. Teenagers do not find bracing to be physically appealing; they might develop social anxiety and negative self-image issues. Braces, especially TLSO braces, squeeze the abdomen and chest wall of a person, which significantly reduces a person’s breathing capacity, causing pulmonary-related problems. 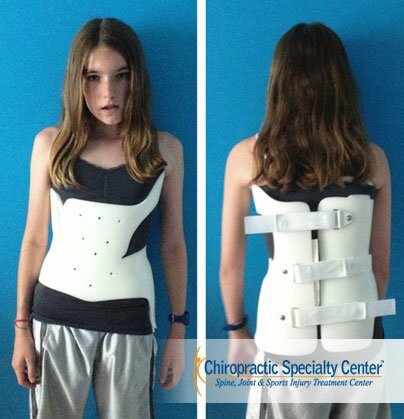 In our centers, we do not recommend bracing as the solution to treating scoliosis. Instead, we recommend patients to live a healthy and normal lifestyle. In addition to our targeted scoliosis treatments, we recommend patients to perform a series of specific scoliosis exercises to strengthen the weakened muscles and stretch the tight muscles. Our methods of scoliosis treatment combine the efforts of physiotherapists, chiropractors with specialized devices, and advanced technology. Scoliosis is a three-dimensional disorder that can only be treated through holistic means. Braces for scoliosis is unable to deliver the comprehensive three-dimensional care needed for strengthening and correction. In fact, some have even experienced worsening scoliotic conditions due to bracing. 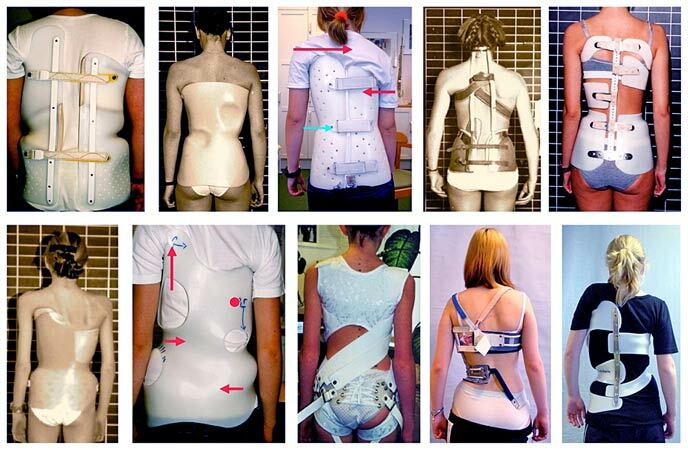 Are you curious about what we do for scoliosis patients? Call us now to book an appointment today before you opt for the useless scoliosis brace!